If for any reason, you do not feel that your purchase has lived up to your expectations simply return it for an exchange or a refund. Audiopark accept exchange any product that is in a new condition. Please make sure items is repackaged, unceased and put into its original gift box. For merchandizes purchase at markets, please exchange at the market you purchased the item from. For merchandizes purchase at our specialty stores, please exchange at the store you purchased the item from. If this is not possible, simply return the item within 15 days of the original purchase for an exchange or refund. Custom, customized or specially sized items are not eligible for exchange or refund. For the wrong color or style, please send the product together with self-addressed prepaid postage bag to us. The purchase price of the merchandise will be credited back to your original method of payment. In the case of an exchange, a new charge will be issued to your account for the replacement. Please indicate your reason for returning the item(s) on the Business Card you received with your purchase. Package the item(s) and the card securely with their original packaging. For any purchase made in US, be sure to address your return to: Audiopark US LLC, Returns Department, PO Box 805, Rimrock, AZ 86335 USA. Drop your package in the U.S Mail at home, at work or at your local post office. If you live outside of the USA, have an APO/FPO address, send the package to: Audiopark Hong Kong Returns Department, Units 213-215, 2/F, Photonics Centre, Hong Kong Science Park, Shatin, Hong Kong. We recommend you use a form of traceable delivery and insure your package for your protection. Please do not send the package C.O.D., as we do not accept returns shipped C.O.D. Credit card refunds will be reflected on your billing statement within 1 billing cycle. We accept the following methods of payment: Paypal, Visa, MasterCard, and Discover cards. Items are charged to your credit card when they ship. If an item is on backorder, you will not be charged until the backordered item ships. Orders with only Paypal verified addresses will be processed. Audiopark US is pleased to offer an Interest and Prepayment Penalty Free Layaway. All of our items are one-of-a-kind so please feel free to use our layaway plan to purchase these special items before they sell out and to lock in the current price for up to six months! 1) The three month payment plan, or 2) The six month payment plan. To place your order with the layaway option, simply check out using the credit card payment option (sorry, Paypal is not available for layaways) and then use the contact page http://www.audioparkco.com/contacts/ to send your request. Simply put your full name, email address, order number and plan selection (three or six month) in the form fields and comment section. It is important that we receive the contact form information immediately following you order placement so your card is not charged until the plan is set up for you. On set up, your order total will be divided into equal monthly payments, to be billed automatically on the same day each month. If you have a special request for the billing date each month, please indicate that in the comments section of contact form. Otherwise, your payments will be processed on the same day of the month as the day the order is placed. When your final payment is made, your purchase will be shipped within 24 hours (holidays and some weekends excluded) and you will be notified via email. We realize that in life things happen. Please let us know if you have a special circumstance in which a payment cannot be made, we would be happy to delay the payment for up to one month, but your delayed payment must be made up the next month. If you are unable to meet the payment policy or you decide to cancel your layaway purchase, your order is subject to the following cancellation penalties. For 3 month layaway payment plans, the cancellation fee is 10% of the original order total. For 6 month layaway payment plans, the cancellation fee is 20% of the original order total. If you wish to pay more than the minimum payment, make an extra payment, or pay the balance early, you can do that by email to customercare@audioparkus.com, or by calling us at 928-592-0331. There are no fees, penalties or extra charges for paying your layaway off early. Regarding Layaway Returns: Our regular return policy applies to layaway items. Your 100% Satisfaction is Guaranteed! See answer #3 above. Legal Disclaimer: After your initial (first) payment, an automated email will be sent to the email address specified in your order each time your credit card is billed or if the charge is rejected. It is your responsibility to make sure that you are able to receive emails from us and to update your email address with us if it changes. If you cannot or are not receiving your monthly emails, you must notify us so that we can contact you with any problems in billing your credit card. Audiopark products are treated to be water and stain resistant- not water or stain proof. High amounts of pigment/ dye in dark clothing may cause color transfer from clothing onto Audiopark product. Friction or moisture can increase the chance of color transfer. Certain leathers can use leather cleaners and moisturizer, be sure to check with the store for details. You can treat most stains on fabric, metal and natural stones with a damp cloth and mild soap. Extended exposure to direct light can cause damage to product. Check with the local store if they fabric cleaner can be used. Please contact your local Audiopark store with any questions regarding your products. For AudioWrap & LeatherWrap, Audiopark provides a one year warranty on the earphone functions, such as the sound performance from the date of purchase. The bracelet ornamentation are covered by a 30 days warranty. For TwistTalk, Audiopark provides a one year warranty on the earphone functions, such as the sound performance from the date of purchase. 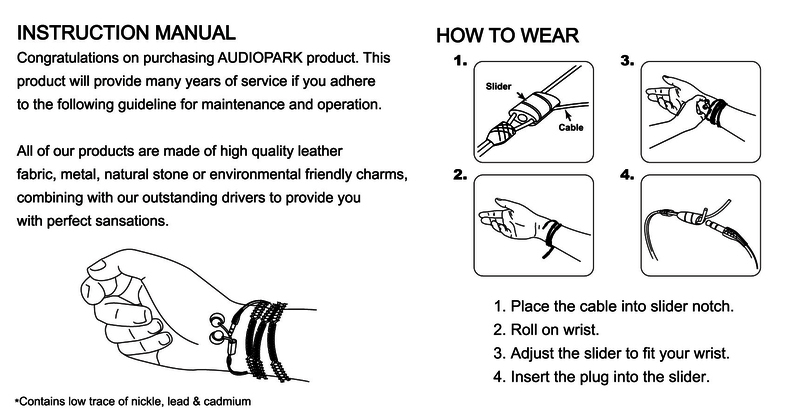 Audiopark reserves the right to amend any of the design and specification of the products. Audiopark ship all over US, EUROPE, Japan, China and all over the World. Orders are carefully filled, packed and ship within 48 hours of your order placement, Monday – Friday via the U.S. Postal Service or UPS. Standard delivery normally takes 3-7 business days depending on your shipping destination. Shipping and handling charges include order processing, packaging, handling and shipping. Standard delivery is 3-7 business days and is a flat rate of $7.25 for shipping and handling. Faster delivery is available through UPS at published rates. Use the quote area in the shopping cart for your specific order and destination. If your merchandise total is over $300 we will waive the shipping and handling costs. UPS cannot deliver to a P.O. Box so please be sure to enter a physical address. For orders over UK and other European countries or regions, goods will be shipped from our Audiopark Hong Kong warehouse door-to-door at a flat rate of USD15. Standard delivery normally takes 7-10 business days depending on your shipping destination. For orders over Asian countries or regions, goods will be shipped from our Audiopark Hong Kong warehouse door-to-door at a flat rate of USD13. Standard delivery normally takes 5-7 working days depending on your shipping destination. International orders take an average of 5-10 business days to arrive. We are currently looking into express postage options for international orders. Please add one day to shipping time frames during Holidays as most carriers are closed. Due to shipping volumes during major Holiday seasons, carriers cannot always guarantee on time delivery. We will do everything possible to see that your purchase ships and delivers as quickly and safely as possible.